And his partner in debt, Senate Majority Leader Harry Reid (D-NV), argued mightily against what he now champions—when a different Administration was in office. History shows us that those in power will always face the temptation of funding their pet projects and initiatives. 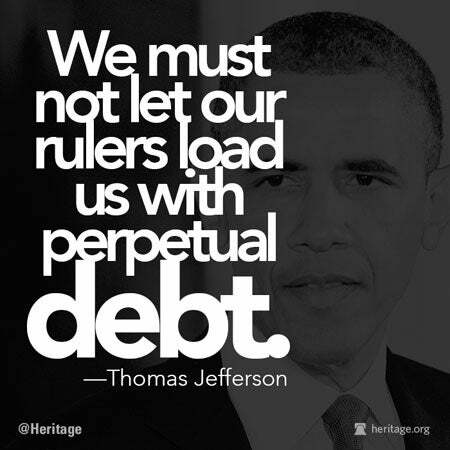 Meanwhile, entitlement spending—the key driver of spending and debt—remains unaddressed. To fix these problems, a responsible constituency needs to consistently hold elected representatives accountable and limit their spending. Have you heard what financial guru Dave Ramsey had to say about Obamacare? This spells trouble for Obamacare: Just 1% of healthcare.gov visitors successfully enrolled. Salsa is now a more popular condiment than ketchup in the U.S. The top 10 reasons why Obamacare will always be controversial. Shutdown feedback: How much of what the government does is actually essential? Is this right? This school’s zero-tolerance policy is punishing a student for being a designated driver. Not all bad news: Senators Ted Cruz (R-TX) and Mike Lee (R-UT) vow to keep on fighting Obamacare. North Carolina Governor Pat McCrory speaks at Heritage today. Watch live at noon ET.